Staff and leadership from the American Board of Internal Medicine (ABIM) continue to travel the country to connect with physicians where they live and work to ensure that they have an open dialogue with ABIM. On August 26, nearly 30 physicians joined ABIM in downtown Chicago. It is feedback from events like this, as well as the MOC Assessment Survey just sent to all ABIM Board Certified physicians, that will inform decisions about the future of the MOC program. We welcome you to continue to email Dr. Baron and me with your feedback. 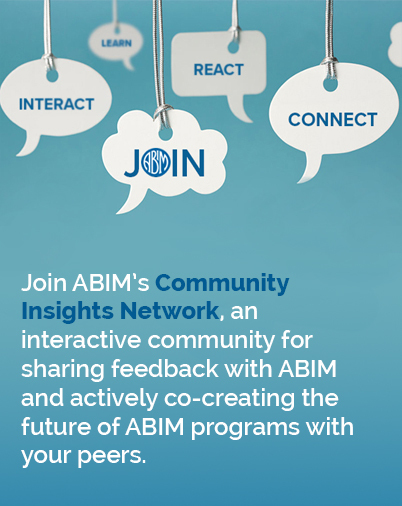 If you would like to be a participant in a future Exploration Day or be a part of our Community Insights Network, please email community@abim.org. An important idea that came up again and again during our discussions in Chicago is developing an MOC program that works for everyone – generalists, subspecialists, those with young families, researchers, community physicians, chief medical officers, and even those who are retired but wish to keep up the credential. This is important feedback and is exactly what ABIM needs to hear to create a program with more flexibility to lessen redundancy. In small group discussions and brainstorms, we heard from physicians that they had general agreement in supporting shorter assessment intervals with immediate performance feedback driving study. Addressing new and important topics would add a great deal of value to the MOC program for them. Some had concerns about a timed assessment, particularly if it is open book where two minutes per question may not be sufficient and could contribute to anxiety around taking the assessment. In addition to the small group discussions held in Chicago, we also hosted a Town Hall to take questions directly from all physicians in attendance. The enthusiastic group posed insightful queries covering some of the timeliest and most important issues regarding the MOC program. We were joined by Marianne Green, MD, who serves on ABIM’s Board of Directors and Council, and is Senior Associate Dean for Medical Education at the Northwestern University Feinberg School of Medicine. Dr. Green and ABIM fielded several inquiries and these—along with an outline of our answers and links to more information—are included below. Physicians found the event “very energizing” and appreciated that ABIM is listening. One participant commented that this was his first opportunity to participate in a meaningful way when so much throughout his medical education and career had been handed down from above. How can an MOC exam reflect the real-world practice of medicine with looking things up and consulting colleagues? Learn more about how ABIM is exploring open-book assessments. What is ABIM doing to ensure the content on the MOC exams is in line with real life practice? ABIM is asking physicians to rate the relevancy of exam topics, is enhancing standard setting and score reporting and continuing to engage physicians in many other ways to get their feedback on ways to enhance the MOC program. What is the future of Practice Performance/Improvement in the MOC program? ABIM will not require Practice Assessment, Patient Voice and Patient Safety in its Maintenance of Certification (MOC) program through December 31, 2018. ABIM still awards MOC points for an increasing array of activities in which physicians are participating within their practices and institutions. What do I do if my certification expires before the new MOC assessment option is available to me? Only certified physicians will be able to maintain their certification by taking shorter assessments. If your certification expires before the new assessment option is available in your subspecialty and you wish to maintain your certification and be reported as Certified, Participating in MOC, you will need to take and pass the current 10-year exam by the end of the year in which your current certification expires. Most of these exams will be based on a blueprint updated for relevance. In addition to taking the 10-year exam by that deadline, you will also still need to meet other MOC program requirements in order to participate in the program and maintain your certification. Read more about the changes to the MOC assessment. How is ABIM rebuilding trust within the community? ABIM is committed to listening to and engaging with physicians and others in the internal medicine community about how we can improve our programs. Only by listening and transforming the program based on what we are hearing will trust be fully restored. Learn more about the changes designed to help ease the burden for physicians we have made so far. We are planning further action based on the feedback we’ve received from the internal medicine community. Who develops ABIM questions and how are they validated? ABIM Exam Committees develop exam questions. All members on the Exam Committees are involved in direct patient care. Full-time practitioner representation outside academic institutions is important to ensure understanding of relevant practice issues across the discipline. Read more. How can the CME I’m already doing count in the MOC program? ABIM and ACCME are collaborating to support physicians who are engaged in lifelong learning to allow them to use thousands of CME activities to meet MOC requirements. Learn more. How should credentialers use and understand the concept of “Certified, not participating”? “Not participating” indicates that a physician has not completed an MOC activity in two years. Learn more about MOC requirements and how credentialers use ABIM’s certification status. How does ABIM spend the MOC fees? Learn more about how ABIM manages the resources that are collected through Certification and MOC fees. What was the pass rate on the most recent Internal Medicine MOC exam? See the pass rates on ABIM’s website. Participants were asked to brainstorm possible qualities for an MOC program and to design their own ideal program that could launch several decades in the future. Ideas ran from covering predictions on the future of medical practice (more shift work, team work and hand-offs) to designing a seamless credentialing system across medicine with ABIM serving as a hub to help physicians meet the requirements of MOC and MACRA. Some ideas are in line with the current MOC models, such as more frequent, open-book assessments with immediate and transparent feedback. Other familiar themes included the importance of a simple program to minimize the time away from patients and a program that is affordable for the average practitioner. In particular, specialists want it to be easier to maintain multiple certificates, potentially by developing a modular exam.